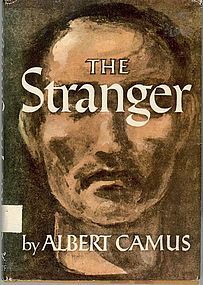 While I did read Albert Camus's The Stranger in high school, I can't say I remember much of anything about it. I was on exchange in Canada and the book was part of my French course, so there was the added difficulty of actually understanding individual words and sentences in the original French. And The Stranger is in no way an easy book, even for adults. It's true that the English translation that I opted for this time wasn't too difficult for choice of words, but it did confound me more than once with its setting and story. However, with my slightly more elevated age (mostly compared to last time), I realized that part of The Stranger's appeal is the way that it makes the reader ask questions about what is actually going on. Meursault is a Frenchman living in Algiers. His mother has recently passed away but his life is mostly ordinary. A series of events unfolds, and as he is mostly dispassionate to them, his life floats along at the mercy of his neighbor and a lover. It is this dispassion (or coldness or detachment) that is, in fact, the center piece of the novel. Meursault is punished for his unwillingness to take a moral stance or show feelings, even if those feelings were only a ruse to conform to expectations. This unwillingness to conform finally drives him to reject society completely. The story rolls along inevitably, but the character depiction is nothing if not intriguing. I remember the original French being brilliant and beautiful, and the translation is mostly excellent, from what I can tell. The Stranger isn't something that you should read in high school, though. Young readers might mistake the stylistic choices for blandness or boredom. They may think that Meursault's inability to show emotion is a fault of the writer and not a key thematic point. And, most crucially, they most definitely won't understand the way that the adult world is littered with unrealistic expectations for all of its dreary inhabitants.